LOOKING FOR FOOD? Contact one of our PARTNER AGENCIES ~ we do not distribute food directly to clients. Love your neighbor as yourself...Serving our neighbors in Plainfield since 1971. Our Mission : To provide emergency food assistance to families of Plainfield who find themselves in need. We were founded through the efforts of the Association of Religious Organizations, an ecumenical clergy group. Our name is a combination of the Judaic Star of David and the Christian fish symbol. Founders were Eileen Cunniff, Mary Nischwitz, Rev. Herbert Saunders, Ann Hale, and Julia B. Purnell. See our Contact Us page for email or to donate! Over the years, we've outgrown the Food Pantry space that we have in the basement of Covenant United Methodist Church. Normally sufficient for our needs, the Pantry was too small at the holidays when we received generous food donations and when we had to stock up on special items for our Holiday Meals Projects. To accommodate our needs, the Church allowed us to temporarily store food items in several other locations. This was not the optimum solution, but it helped us put things away until we needed them. 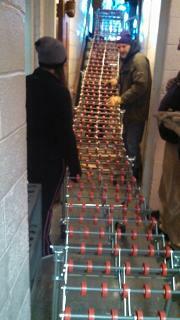 Unfortunately, this also squeezed the Church out of part of their own storage room. Working the the Trustees and at their suggestion, we agreed to expand our Pantry into an adjacent room by erecting a partition wall, giving us 100 square feet of additional floor space. 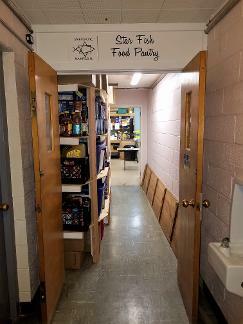 We also relocated the entry doors to the pantry and, doing so, adopted a wide corridor as part of our storage area. In both the areas, we constructed floor to ceiling shelving on one wall, the combination of which gives us over 750 square feet of shelf storage space. All of our food storage is now within our expanded Pantry area. We are most grateful to the Trustees and members of the Church for allowing us to be a part of their family for over 45 years. Christmas Meal Project A Success! 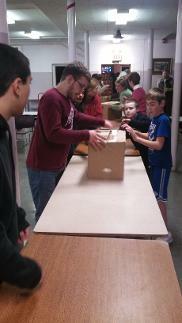 We had a great day on Thursday, December 20, packing Christmas dinners for 160+ families in need in Plainfield. Food items per family - Vegetables, mashed potatoes, yams, stuffing, gravy, dinner rolls, cranberry sauce, macaroni and cheese, fruit, milk, tea, margarine, dessert cake, and frozen chicken for families of 3 or less, frozen turkey for families of 4 to 6, and frozen large turkey for families of 7 or more. The number of each item varies depending on the size of the family and will fill between 2 grocery bags up to 5 bags for large families. We create and post these lists of items by size of family so volunteers know how many of each item a family will receive. Work of the packing day itself - pulling all chairs from the packing room and arranging enough tables for the number of agencies/people being helped; posting the list of items being distributed at various places in the room including on each table; arranging each agency's clients' bags around their table(s); bringing the many heavy crates and boxes of food supplies out of the Pantry and setting them up in the same order as the table lists; prepping small items like tea and margarine in baggies; working at the tables to bring the correct number of food items for each table's families; carefully packing the bags with food, dessert cakes and chicken or turkey; helping the receiving Agency workers carry the bags to their cars; breaking down boxes, bundling for recycling, and taking them home to recycle (no recycling at the church); restoring the packing room to the condition it was found. So you can all see why we are grateful for the number of people who come out to help. We started at 9:00, did all of the work for those 160+ families, and were finished by 11:30 a.m. We've done this with fewer helpers and been there until 1:30 or 2:00 in the afternoon. We are especially grateful for our younger volunteers - the high school and college and other young adults - who came out to help. There's a lot of heavy lifting at various stages in this process, and most of our volunteers are retired and not quite as strong as we used to be. So please, spread the word about the great work that we do and that we do need some new, younger help for just a few hours three times a year for our holiday dinner projects. We could also use some help for one or more of our three days each week that we package weekly food for families in need of emergency food assistance. Some of our current workers are 80+ years young and may soon need or want to slow down. We pack food Tuesday, Thursday and Friday mornings from 9:00 until about 10:30; other volunteers deliver that food to the requesting Agency. There are, of course, other jobs that get done as needed - bringing in and stocking food from various generous donors, taking stored food out of crates and boxes and putting it on shelves, picking up the food that we purchase and carrying it into the pantry, etc. etc. Think about how you might be able to help with the physical parts of our work, or, if you are unable to do those kinds of things, perhaps refer our needs to your friends or family members who might be able to help. On behalf of our director, Marie Pase, and the rest of our Board of Directors (Kathleen Nitzsche, Treasurer; Catherine Renga, Holiday Meals Director; Joe Stowasky, Food Purchasing Director; and me, Secretary), I extend our most sincere thanks to all of our friends and wish you good health in the New Year. We are very pleased to announce that the Plainfield Foundation has supported our Holiday Meals Project with a most generous grant. This grant will help us purchase the food needed for our Thanksgiving, Christmas and Easter holiday meals distributed to 160 families in need each on each of these holidays. Read more at the Holiday Meals page. Meet one of our volunteers...Joe Stowasky! Joe Stowasky is a pharmacist who graduated from Rutgers in 1973 and owned his own pharmacy in Clark for 25 years. After selling the pharmacy to Rite Aid, he was employed at a long term care pharmacy for 19 years before retiring 2016. Joe is currently an active parishioner at St. Helen's Church in Westfield since 1989. He is known for his generous spirit and friendly manner. Joe began volunteering at Star Fish in November 2017 and is currently purchasing chair, assists in picking up orders at the Community Food Bank of New Jersey, and occasionally delivers to some of the agencies in Plainfield. "I'd recommend Star Fish to anyone who is looking for an opportunity to donate to a worthy cause, whether it is food items we always need or financial assistance that helps when we purchase food." Go to our Contact Us or Donate page for more information on how you can help. 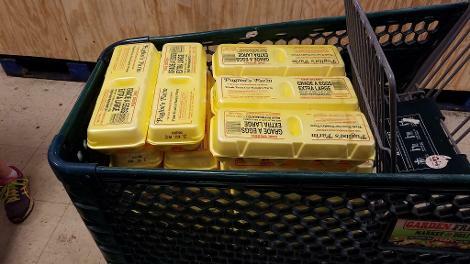 Thanks to our generous donors, we are able to purchase fresh eggs to go out in every grocery order that we package. Here, our volunteer is stacking 30 dozen eggs purchased from Green Olive Market in South Plainfield at an incredible $0.89 per dozen. WHICH CAME FIRST, THE CHICKEN OR THE EGG-O-MAT? We don't care which came first, as long as we have fresh eggs for our clients. How many eggs, you say? Well, our average annual number of food orders is 1220, and each order includes a half-dozen eggs. You do the math and you come up with 610 dozen eggs a year or about 50 dozen a month. Egg prices vary, but we normally pay about $1.29 per dozen (sometimes medium, sometimes large, depending on the market). That's $65 per month, give or take. Now, thanks to Sarah Mazzarese AND Brian Townley AND Pat Bixel AND Joe Stowasky, we have the FOUR regular monthly donations we need to purchase eggs. 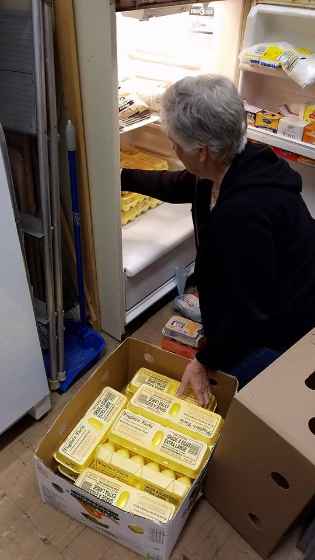 Two of our volunteers shop for eggs every few weeks to make sure the fridge is stocked and ready to go, so our Egg-O-Mats will fund those purchases. You may have missed out on the opportunity to be an egg donor, but we have other needs that you can help satisfy. Food donations are gratefully accepted, along with monetary contributions - they help us when donations don't keep up with demand. Go to our Contact Us or Donate page and click on the Donate button, then use the Contact Us form to let us know what you'd like your donation to go toward. And "thank you" in advance! THANKS TO OUR LOCAL LETTER CARRIERS! 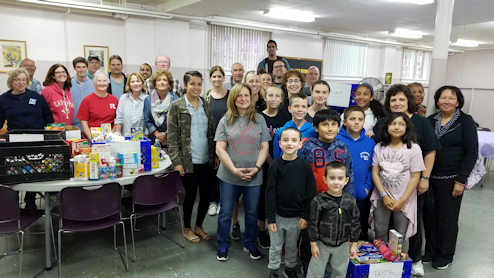 Almost thirty men, women and children came down to the Food Pantry to receive, sort, and shelve boxes and boxes of food that Plainfield residents donated to the Stamp Out Hunger drive on the Saturday before Mother's Day. This drive is a nation-wide effort by the National Association of Letter Carriers to collect food for people in need. Carriers collect the food on their routes and bring it in at the end of the day. We are fortunate to be recipients of food from the Plainfield letter carriers, thanks to Nancy Piwowar, a retired letter carrier. Nancy has coordinated the collection and delivery of the food to Star Fish for many years. If you'd like to help, click here to send us an email for more information and details. Or make a stop at your favorite grocery and pick up some of the items on our "Shopping List" page. We always need everything. Or you can go to our "Donate" page and make a secure donation through PayPal. It's that easy to help a family in need. The volunteers who helped receive, sort, and shelve the food donated by Plainfield residents through the NALC food drive. We have volunteers who come down on Tuesday, Thursday, and Friday mornings to pack up groceries for families in need. They call our Partner Agencies or respond to phone messages and prepare bags of food for those in need. Pictured at left is Patty Bixel, one of our regular volunteers who helps pack food bags every week. We also have drivers who come down and load up their cars to help get that food to the Partner Agencies on those same mornings. Volunteers are always welcome! Use our contact us page. Food is packed in brown bags with plastic for easy carrying! And we serve it with a smile, just like Patty Bixel. The Service Club of students at the Woodland School in Warren donated boxes of food to the Pantry again in 2018. We had send out a solicitation for help for the postal letter carriers' food drive, and one of the responses was the Service Club's offer of even more food! We gratefully accepted this donation as a meaningful contribution to our food supplies for people in need. Anyone can donate! Use our Contact Us page to let us know what you have and we'll gladly come pick it up! Woodland School in Warren 4th grade collects food FOR STARFISH!! 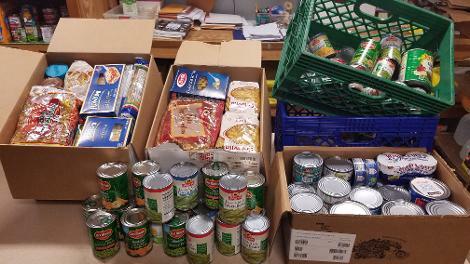 The students in the fourth grade at Woodland School in Warren took on a service project and collected the food pictured here and donated it to our pantry. It all started with the school's 2016-2017 goal of service. Go to our News and Updates page for the full story. The Frippery Thrift Shop at Wilson Memorial generously donated toys for our Christmas Holiday Meal Project in past years. Their generous donations helped assure that children of our clients would have some toys for Christmas. Effective in 2018, we stopped distributing toys with the Christmas meals. We found that our clients receive gifts from a number of other sources and our energies are best used in handling the meals themselves. We thank the Frippery and the employees and owner of VIP Honda in North Plainfield for their past contributions. Shelves at the food pantry are full at Thanksgiving time, thanks to the generous donations of our friends. Both individuals and groups pull together to help us re-stock our pantry every year at Thanksgiving. 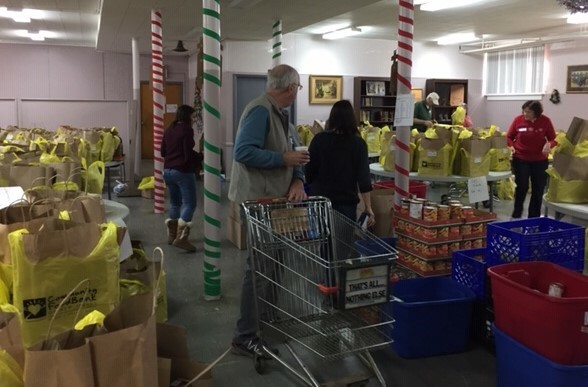 Donations from Faith Lutheran Church in New Providence top our list of donors that include Union Catholic High School and Immaculate Heart of Mary Church in Scotch Plains, as well as College Achieve Charter School in Plainfield/North Plainfield. Read more about 2016 donors on our News and Updates page. Regardless of the amount of food recently donated, please know that all of it goes out the door almost as fast as it comes in to us. We can always use your donations of food or funds to help us build up our supplies and enhance our offerings. Every year, we offer our Thanksgiving, Christmas and Easter Holiday Dinner Projects to our people in need. You can volunteer to help at any or all of theseby going to our Contact Us or Donate page. If you need help yourself, contact one of our Partner Agencies and they will help get the ball rolling. If you do not need help, consider donating food to others in need. See our How to donate page for more information on how to donate. Who doesn't like fresh vegetables from a local farm or garden? We are blessed by the support of our friends at the Rotary Club of the Plainfields who have partnered with the Giving Garden at Wagner Farm Arboretum to supply us with fresh vegetables throughout the harvest season. We have given our clients beets, green beans, squash, zucchini, tomatoes, peppers, okra, potatoes...all of this grown locally at the Giving Garden by volunteers, including our Rotary friends. That club plants two plots of vegetables each year and donates their harvest to our food pantry. Giving Garden volunteers also travel to the Rutgers Research Snyder Farm in Pittstown to pick up donations of fresh corn, tomatoes, squash, peppers, and many other vegetables grown there, as well as boxes and boxes of apples from their orchards every Fall. These weekly trips generate large boxes of fresh vegetables and fruit for our clients through November, even giving us pumpkins! We are truly blessed! 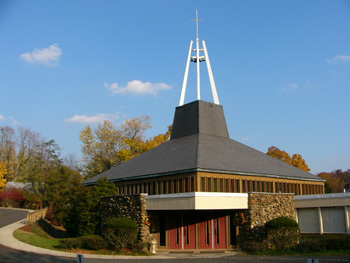 We sing the praises of our friends at Wilson Memorial Church in Watchung. The congregation supports our food pantry with their time, talents and treasure. Longtime supporters, they recently donated two brand new freezers to replace old, non-working space-takers. Now we can better store our frozen breads and meats and dispense them as needed. And the Frippery Thrift Shop donates generously every year! Thank you, Wilson Memorial. You are our angels. Thank you Rotary Club of the Plainfields!! Pictured at right are some of the groceries delivered by our long-time Rota rian friends at the Rotary Club of the Plainfields. The students at Mt. St. Mary School in Watchung help us each year by having a friendly competition leading up to Super Bowl Sunday that they call "Super Cereal Bowl." Each homeroom is asked to bring in boxes of cereal to benefit our food pantry, with the special Super Cereal Bowl trophy (yes, a real trophy!) awarded to the class that brings in the most boxes. The following message was posted on the MSM Facebook page recently. "Thanks to all those who supported this year's Super Cereal Bowl, sponsored by the HOPE Club and Peer Ministry. 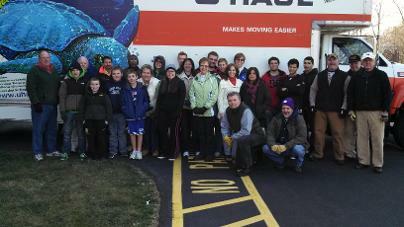 Amid winter break and several snow days, they collected 400 boxes to benefit the Star Fish Food Pantry. 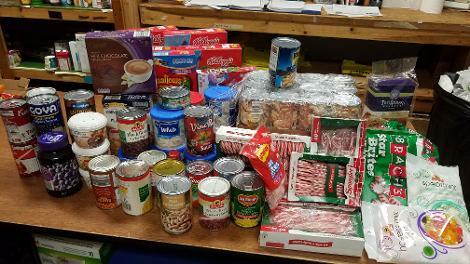 Congratulations to Homeroom 10B on donating 47 boxes, the most brought in by a single homeroom this year." 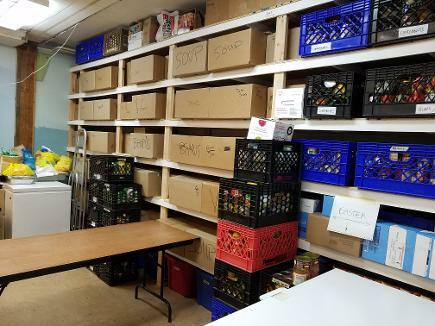 We have partnered with the Community Food Bank in Hillside to help us meet the needs of our clients and, at the same time, stretch our limited funds. Because the Food Bank receives food in bulk from grocery chains and others, they provide the food at a significantly lower cost than we could otherwise enjoy. While we always used healthier ground meat and lower-fat hot dogs, we are now able to offer more variety meats, depending on what is available at the Community Food Bank. For example, the Food Bank had frozen chicken parts available when we picked up our recent order. What a treat to be able to give this food out to our families in need! See our News and Updates page for more about this new partnership. What a great day! Every year, approximately 25 people help pack dinner bags for 160 families. We also give out donated toys and other gifts for the children of these families. 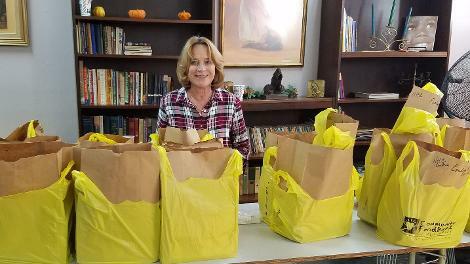 Dinners of ham, yams, corn, green beans, mac and cheese, pineapple, tea and cake are packaged and ready to go by 11:00 a.m.
"Thank you" to all of the volunteers, both those who've been there for years and the new people who come out for the first time. We appreciate all of you for your help and generosity. 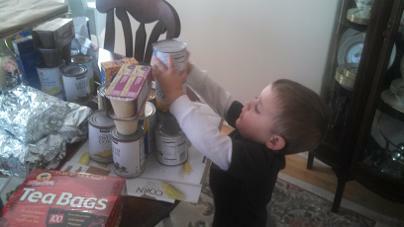 Our youngest helper, Jonah, adds a can of corn to a family's Christmas dinner order before bagging it for delivery. 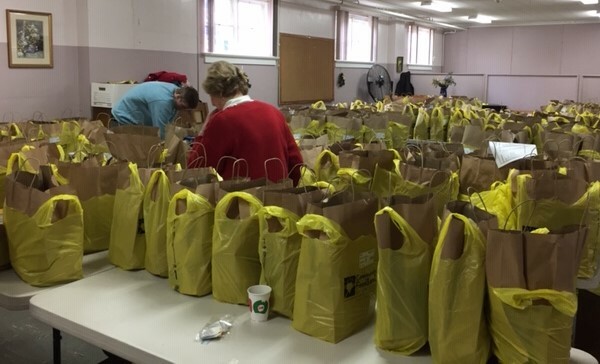 Volunteers pack 160 dinners for Thanksgiving, Christmas, and Easter every year. Genevieve Nitzsche, Marissa Berrios, and Michael Townley pose behind the nineteen dinner bags put together by AOLP students. Students at the Academy of Our Lady of Peace in New Providence donated nineteen Thanksgiving dinners and enough money for twelve turkeys to our Food Pantry this year. Genevieve Nitzsche, a student of the school and a granddaughter of the late Eileen Cunniff, one of the founders of the Food Pantry, spearheaded the event. Genevieve enlisted the help of the Student Council to sponsor a food drive. Each grade, from pre-K to eighth, was given the list of food items that we give out on Thanksgiving and was asked to put together at least one dinner. In addition to the food drive, the Student Council also sponsored a dress down day that raised the money for the twelve turkeys. 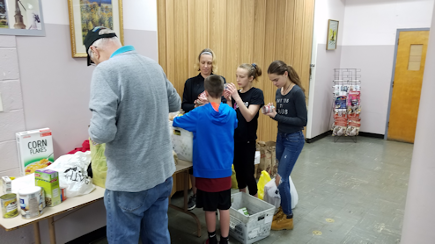 After the food drive concluded, the children had brought in enough of the needed items to make up nineteen dinners, which were delivered to Star Fish on November 25 by Genevieve Nitzsche and Marissa Berrios. Members of Faith Lutheran Church in New Providence pose after unloading this truck that was packed with food for our Pantry. 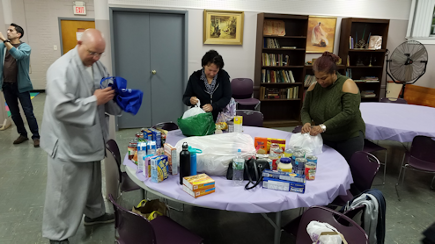 This faith community has helped us for over 25 years, bringing canned goods, pasta, sauce, peanut butter, jelly, tuna fish, mac and cheese, and much more to the Pantry on the Saturday after Thanksgiving. Not only do they collect the food, but they also box it separately, making it easier to store and easier to handle. The group arrives with their own roller ramp that they set up from the truck down into the basement. Workers on the truck carry the boxes to the slide where others guide them to tables. 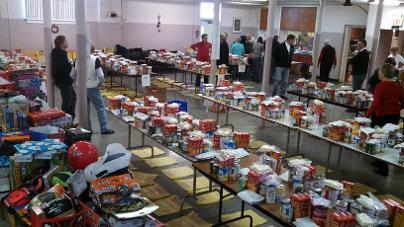 Other members, young and old, carry the pasta to one location, the canned goods to another, and the cereal to a third. Many hands make light work, and within an hour, the entire task is completed. We are so blessed to have these friends support our efforts. We are also grateful for the generosity of women and men of Local 423 Utility Workers Union of America. Steve Mangione, representing the Union, contacted us to announce that the Local had selected Star Fish to receive a $500 donation for the Christmas 2013 and our Christmas 2015 holiday projects. The Local represents the women and men who work for American Water Company in our area. They made their decision, in part, on the good works found on our website! Problems with this website? Please contact the Webmaster here.